Imagine a world without telephones, it’s pretty inconceivable. In a time when near enough everyone is little more than a punch of a few digits away, the youngest among us may struggle to think of a time when letters were the modus operandi. Once, if you wanted to talk to someone you had to meet them face-to-face. The idea of which will surely send a shiver down the spine of many a tech-savvy, textaholic pre-teen. The first telephone call ever made. There is some question over whether Alexander Graham Bell or Elisha Gray should be fully credited with the invention of the telephone. It was, though, Bell who made the first telephone call in history in Boston on March 10, 1867. After calling people within the same city, and then people within the same country, had been mastered the time came for overseas correspondence. By 1926, making a call across a vast ocean was not a new idea. As early as 1915, short transmissions had been demonstrated as viable and calls had been made to ships for some time. A full conversation across an ocean as big as the Atlantic had not been a reality until the first call from London to New York was made. The first telephone cable between the UK and the US was laid underwater in 1956. Obviously a world away from the tiny, smooth handsets we have today, mobile phones have been about in some form or another for over 60 years. In the US, engineers from Bell Labs began work on a system to allow telephone calls to and from automobiles – this first of which was on June 17, 1946 in St Louis. Shortly after, AT&T offered Mobile Telephone Service. A range of unreliable, rudimentary mobile phones that offered limited coverage. Reporters and truck fleets were among the first to use the early mobile phones, which were very expensive and equally cumbersome. On April 3, 1973, Motorola employee Martin Cooper made the first ever hand-held mobile phone call to Joel Engel, head of research at AT&T’s Bell Labs. The device was the huge – to today’s eyes at least – Motorola DynaTAC prototype. It weighed 2.5 pounds and measured 9 inches long, it offered a talk time of just 30 minutes and took ten hours to re-charge. 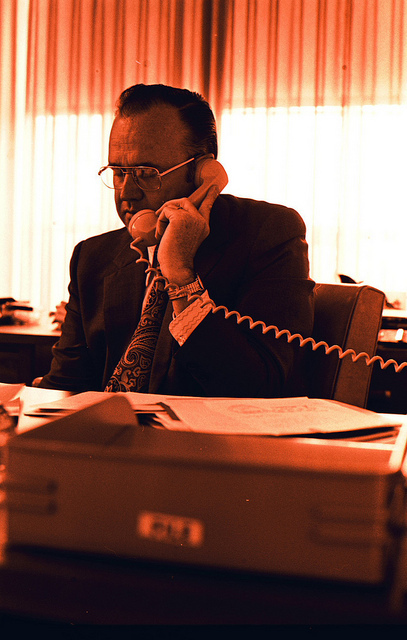 Prior to 1973, mobile telephony was limited to phones installed in cars and other vehicles. Not really classed as a ‘telephone call’ but important all the same. Short message service (SMS) was born on December 3, 1992. British engineer Neil Papworth, 22 at the time, used his computer to wish a “Merry Christmas” to Richard Jarvis, of Vodafone. He didn’t get a reply because there was no way to send a text from a phone in those days. That had to wait for Nokia’s first mobile phone in 1993. Guest post contributed by Lauren Jones, an expert in the telephone system business, helping people & business to see the benefits of call handling services. « How to Save a Wet Cell Phone?